Girly pages are so much fun with Chatterbox floral papers. They provide gorgeous feminine backgrounds as well as versatile and unique embellishments. Have a go! You'll have a ball! This layout was created using Chatterbox Powder Gumball Stripe paper, Chatterbox Powder Rosey Flower paper, Chatterbox Rosey Nook Blossoms paper, Chatterbox Light Nook Plaid paper, Chatterbox Cottage Lilacs cardstock, pink ink, a pink glitter pen and pink square alphabet stickers. Use the Chatterbox Powder Gumball Stripe paper for the background. I have turned it on its side, but it depends which direction you want your stripes to go. Tear a strip of the underside of the Chatterbox Cottage Lilacs cardstock approximately 5cm wide and adhere down the left side of your page. Cut a piece of Chatterbox Powder Rosey Flower paper measuring approximately 21cm by 14.5cm. Ink around the edges with pink ink. Adhere to your page approximately 2.5cm from the top and 2cm from the left edge. Tear a strip of Chatterbox Cottage Lilacs cardstock approximately 3.5cm wide. Try to follow the same shape as the first strip. Ink the white edge with pink ink and adhere down the left side of your page. Mat your photo with the underside of the Chatterbox Powder Rosey Flower paper. Tear a strip of Chatterbox Rosey Nook Blossoms paper and adhere down the right side of your photo mat. Cut a piece of Chatterbox Light Nook Plaid paper measuring approximately 3.5cm by 11.5cm. Adhere vertically approximately 4.5cm from the top and 5cm from the left edge of your page. Place your matted photo on top, as shown in the layout above. Cut out flowers from the Chatterbox Cottage Lilacs cardstock. Arrange an assortment on the right side of your photo. Also place a small branch on the top left corner of your photo. You may wish to highlight the flowers with a pink glitter pen to help them stand out. Cut a strip of Chatterbox Light Nook Plaid paper measuring approximately 11.5cm by 1cm. Position on the right edge of your page approximately 0.5cm from the bottom. Cut a strip of Chatterbox Rosey Nook Blossoms paper measuring approximately 24cm by 11cm. Position on the right edge of your page approximately 1.3cm from the bottom. Arrange three photos next to each other along this strip. Now on to your title. 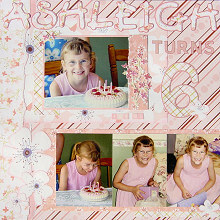 To create the first word of your title (in my case, Ashleigh), cut your letters from Chatterbox Cottage Lilacs cardstock. Mat each letter with the underside of Chatterbox Powder Rosey Flower paper. If you like, you can also outline each with a pink glitter pen. Arrange them across the top of your page. To create the second word of your title (in my case, Turns), cut your letters from the underside of Chatterbox Light Nook Plaid paper. If you like, you can also outline each with a pink glitter pen. Arrange them on the right side of your page, underneath the first word of your title. To finish off your title, cut a large number or monogram (in my case, 6) from Chatterbox Light Nook Plaid paper. Mat with the underside of Chatterbox Light Nook Plaid paper and outline with a pink glitter pen. Position underneath the second word of your title. Cut out a selection of flowers from Chatterbox Rosey Nook Blossoms paper and ink the edges with pink ink. You may also like to use your pink glitter pen to highlight the centre of your flowers. Arrange them in the bottom left corner of your page as well as anywhere else you would like to highlight. Finally, use small pink alphabet stickers to add a date underneath your photo.